Looking for a great way to extend your reach in the Covington community? Support the next generation of our workforce by investing in our young people! In recent years, hirers and educators alike have realized there’s a big gap between what employers expect of a new employee in terms of skills and competency, and what a new employee is actually able to do. This misalignment between business needs and education curriculums leaves jobs without people and people without jobs. But chambers across the country are stepping in to provide a vital link between businesses and their future workforce! Here at the Chamber, we partner with the Kent School District, Rainier Christian School District, and other local schools to foster lasting connections between local businesses, educators, and students. 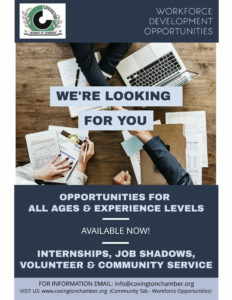 By providing career counseling, scholarships, job shadows, mentoring, community service, and paid and unpaid internships, our goal is to provide students and their families with valuable exposure to career opportunities right here in their own community. Businesses benefit in a myriad of ways. When businesses engage with kids, their parents follow. When businesses engage with kids, they build a strong reputation for doing good in their community. And in the long-term, they’re investing in their own success by investing in the next generation of workers. Every time we connect business owners and students face-to-face, young people gain real-life perspective, expert insights, and support as they work to align their skills and their career path.